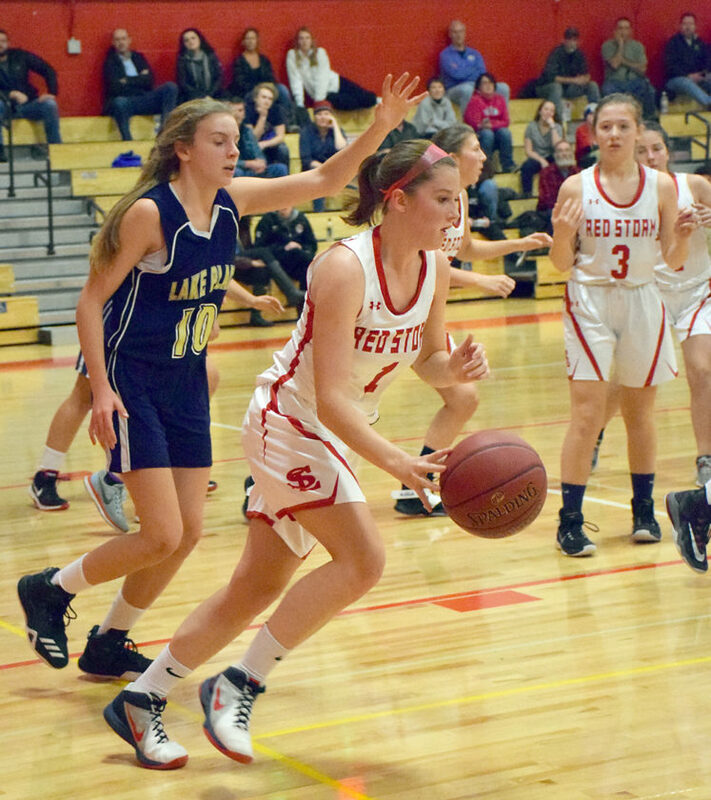 SARANAC LAKE — Despite a late rally by visiting Lake Placid, the Saranac Lake girls basketball team held on for a 45-28 win Tuesday night at home. The Red Storm jumped out to an early lead and never really looked back, although the Blue Bombers rallied in the second half to cut the home team’s margin. Saranac Lake took a 14-2 lead with 30 seconds left in the first quarter, but two free throws by Lake Placid’s Dylan Bashaw and another basket ended the quarter at 15-6. The Storm held their lead through the second quarter. Late in the quarter, Serena Stevens fed the ball from the right side of the key to Amya Hurteau at the free throw line for a jumper that gave the home team a 23-10 advantage going into the half. The young Lake Placid team — which had only freshmen and sophomores suited up for the game — rallied in the third and began to close the gap. 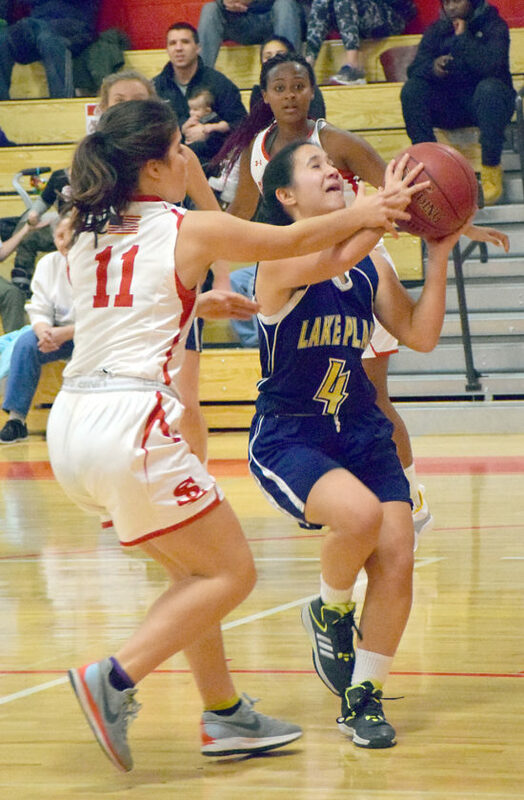 Arnita Cecunjanin showed prowess under the boards at both ends of the court for the Bombers, as the Blue Bombers posted 12 points to Saranac Lake’s nine in the quarter. 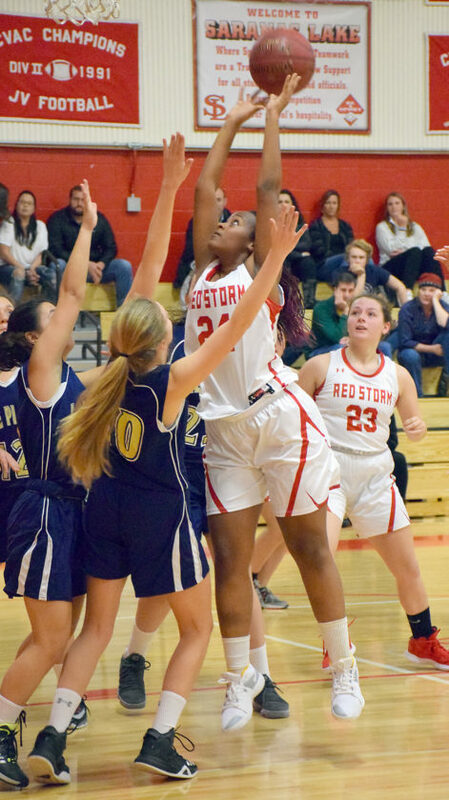 Lake Placid cut the Red Storm lead to 10 with 1:30 left in the third, and Bombers’ point guard Natalie Tavares reduced the spread even further with a jumper from the left corner that brought the score to 30-22 going into the final quarter. 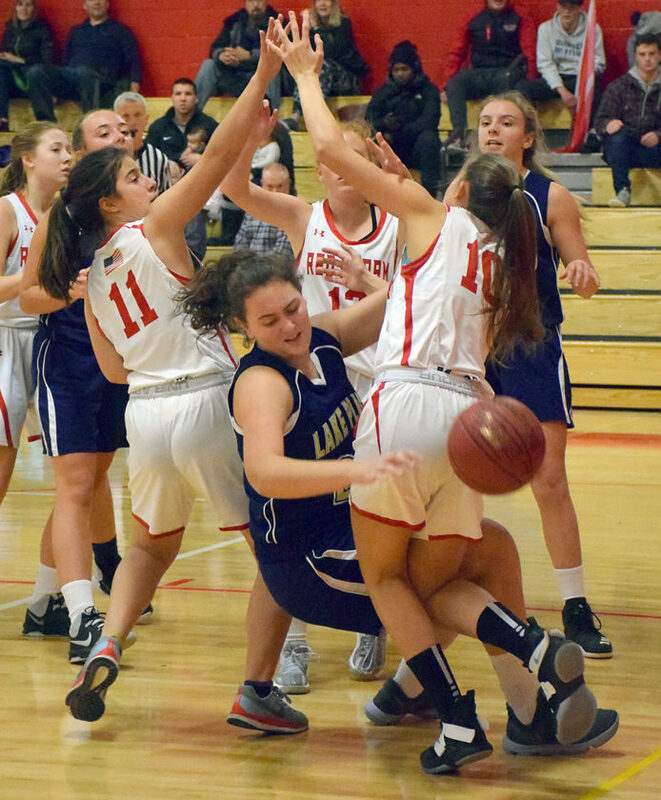 But Saranac Lake began to pull away again, and by the midway point in the fourth, the home team was up 37-24. The Red Storm defense came up big late in the game, creating at least a half-dozen turnovers and broken plays. Many of those steals led to quick turnarounds and a series of unanswered points that the visitors could not overcome. Saranac Lake’s Nora Glover led the scoring with 19 on the night, while Tavares led the Bombers with 10. 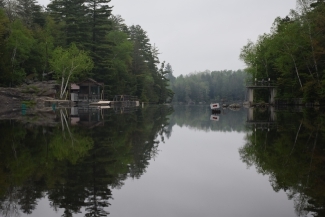 For Lake Placid, Cecunjanin, Bashaw, Izzy Armstrong, Chelsea Moore, Deidra Kellerman and Grace Crawford all put some points on the board. In addition to Glover’s 19, the Red Storm’s Kylee Clark, Maggie Carpenter, Hurteau, Olivia Bell, Stevens and Alex LaDue each contributed to the win. Tavares said that for such a young team, the Blue Bombers played well. “For being a really young team, I think we played pretty good,” she said. “We don’t have any juniors or seniors so we’re basically a JV team. Lake Placid coach Jeff Potter said with such a young team and a switch this season to facing teams in the southern part of Section VII, the season is going to be a learning experience. 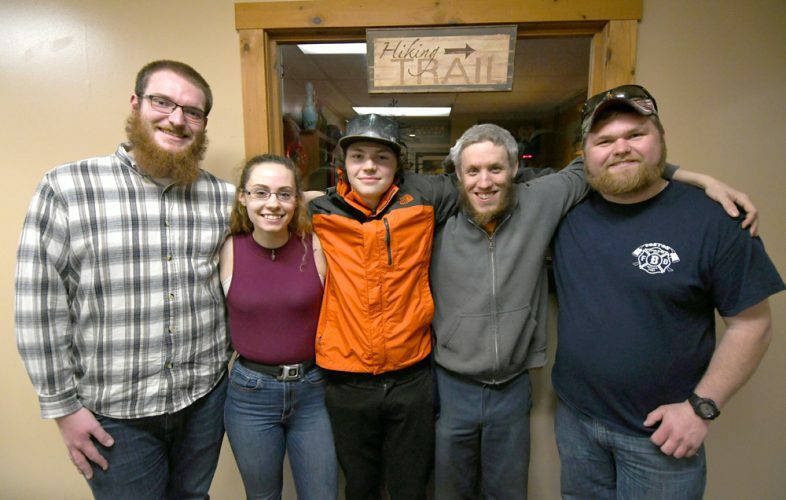 “We’re young, so it’s going to be an interesting season,” Potter said. “But it’s a good group of kids and some really good athletes; we just need to make them basketball players. Potter said he was missing his lone junior and senior on the roster, one due to grades and the other due to injury. Saranac Lake improved to 1-1 on the season with the win and coach Chad LaDue said each game has been an improvement. “From our scrimmage to Westport to now, we’re seeing improvement each day and hope to continue that progress,” LaDue said. “We were able to get all 12 girls into the game and I thought that the girls coming off the bench gave us a spark. Alex LaDue, a freshman who put up seven points in the contest, said she was particularly happy with the Red Storm’s defensive efforts. Saranac Lake next hosts AuSable Valley on Wednesday, Dec. 12 at 7:30 p.m., while the Bombers travel to Bolton on Thursday for a 6:30 p.m. game.